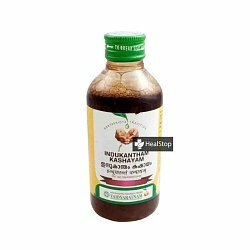 Dhanwantharam Kashayam is a herbal decoction prepared in the form of a syrup. The Kashayam includes Bala moola (Root of Sida rotusa), Yava (Hordeum vulgare), Kulattha ( Dolichos biflorus), Dashamoola which is a group of ten roots etc. 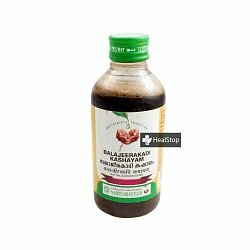 The Kashayam is effective in the treatment of Rheumatic Disorders. It promotes strength and is useful in Postnatal diseases. Dosage: 15ml twice daily with 4 times of lukewarm water , one hour before food, or as directed by the physician. *Before use, kindly consult your doctor!